As Anchorage voters prepare to decide whether to OK the sale of city-owned Municipal Light & Power, the proposed buyer, Chugach Electric Association, has launched a $245,000 advertising campaign in hopes of convincing people it's a good idea. But at public meetings and in editorials, a growing number of voters and community leaders say they're worried about understanding a complicated deal they think is moving too fast. 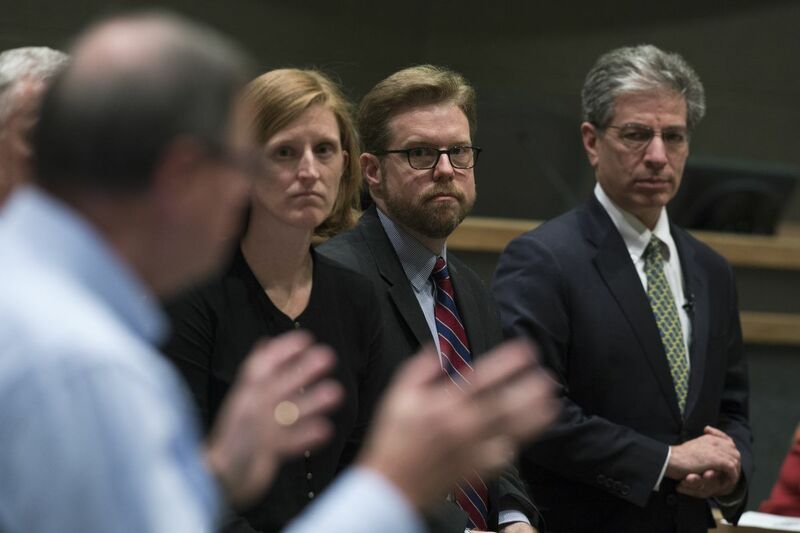 City officials at these meetings are increasingly needing to address murmuring suspicions and complaints the deal hasn't been transparent enough. At stake is Anchorage's largest-ever public asset sale, and only the second time the city has sold off a utility. This year, Anchorage is holding its first mail-ballot election, and ballots go out next Tuesday. The last day to vote is April 3. City and Chugach Electric officials have stressed the public vote is just one step in a long public process toward a sale, a long-discussed idea that coalesced over a matter of months in 2017. The advertising campaign has two major themes: Two utilities in the Anchorage Bowl just don't make sense, and the deal will save money for ratepayers. 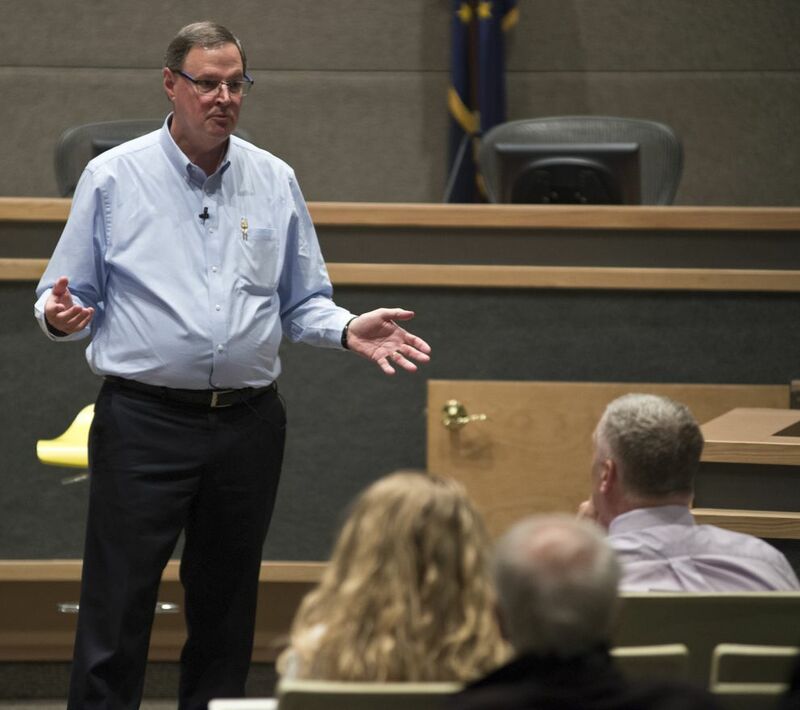 Lee Thibert, the chief executive of Chugach Electric Association, said during a Monday town hall meeting that Chugach and ML&P would merge into a single headquarters. There will be less duplication of business operations, and the two utilities already have a number of business partnerships, he said. He said the deal doesn't create a monopoly, because the two utilities don't currently compete for Anchorage customers. "It's not about selling the utility to get the highest value," Thibert said. "It's about creating one utility." Low interest rates were driving the quick pace of the deal, Thibert said. Thibert reiterated promises made in the ballot proposition that there would be no base rate hikes or layoffs as a result of the deal. He said Chugach would "right-size" its staffing over time through attrition. Savings, he said, would lead to lower rates over time. He added that he couldn't promise rates wouldn't rise for other reasons, like inflation or labor costs. People who attended the town hall didn't argue much with the idea that the city should divest itself from ML&P. But meeting-goers were skeptical of whether what Chugach had proposed was actually the best deal, and whether Chugach could keep its promises. Chugach plans to borrow $712 million, to be paid up front, and pay the city an additional $312 million over time. After starting talks with Chugach, the city also received expressions of interest from five other companies, including the Fairbanks-based utility Golden Valley Electric Association;CIRI Energy, a subsidiary of the Native corp. CIRI Inc.; and Matanuska Electric Association. A financial analysis by Goldman Sachs to determine ML&P's worth, and details of five other offers, have since been disclosed as a result of public records requests. City manager Bill Falsey has said non-disclosure agreements prevented the city from volunteering the information. Falsey said at Monday's town hall the Chugach bid was competitive. He produced a comparison chart showing how the deal stacked up. He stressed that there were other factors with Chugach you can't put a number on, like giving Anchorage voters the chance to sell a utility to themselves. But the way the deal unfolded has sparked transparency concerns. Earlier this year, Judy Brady, the chair of the ML&P advisory commission, resigned from the commission. She wrote in a Jan. 25 letter to Berkowitz that she was disquieted by the secrecy surrounding documents and meetings up to that point, noting the deal had only been announced a month earlier. "The bottom line is keeping the lights on," Brady wrote to Berkowitz. "This is worth full disclosure of challenges and benefits." Rebecca Logan, Berkowitz's leading challenger in the mayoral race and a former chair of the Chugach Electric board, said in a recent Anchorage Chamber of Commerce questionnaire that while the consolidation of ML&P and Chugach Electric "needs to happen," questions surrounding the sale had created "unease and distrust" among many voters she's talked to. The heads of other companies that expressed interest in ML&P, like Golden Valley Electric Association and CIRI Energy, have indicated in interviews that they were caught off-guard by the city's announcement to pursue a deal with Chugach. At Monday's town hall, Falsey defended the administration's deal-making. He said the talks with Chugach followed a specific direction charted out by the Anchorage Assembly in a June 2017 resolution. A similar request had come from the Anchorage Economic Development Corp. earlier that year, with businesses complaining about ML&P's plans for a major rate hike to pay off the cost of a new power plant. A significantly better offer from another company could have jolted the city off that course, Falsey said. But he said no such offer arrived. "If I cannot persuade you the process we used is good, look at the deal on the merits," Falsey said. "We haven't heard a substantive objection to the merits of the deal." Chugach Electric has for some time eyed the acquisition of ML&P as a strategic priority. In 2007, the city and Chugach Eletric paid for an exhaustive study that looked at ways to combine operations. The resulting report, by Chicago-based Navigant Consulting, spanned nearly 130 pages and cost more than $1 million. Among other conclusions, the report said Chugach couldn't afford to buy ML&P, though ML&P could buy Chugach. Thiebert said Chugach disagreed with some of the findings of the report. Former U.S. Sen. Mark Begich, who was mayor of Anchorage at the time, said in a Tuesday interview that the study was prompted by the belief that there were too many utilities in the Anchorage area. But, he said, "the dynamics were not there." Both Begich and Thibert say much has changed since 2007. On top of the lower cost of borrowing money, Chugach is in much better financial shape, with a higher credit rating, Thibert said. Begich's role in the deal has drawn some chatter. His consulting firm, Northern Compass Group, has advised Chugach Electric Association since early 2015 on a variety of issues, including the acquisition of a Cook Inlet gas field. Begich said he's advised ways to manage public perception around the Chugach deal, but has not been involved in financial details. He declined to state the amount of his firm's contract with Chugach Electric but said he's paid a flat sum for his involvement. During the Monday town hall, Uwe Kalenka, a longtime Anchorage political activist and a former vice chairman of the Chugach Electric Association board, approached the microphone. He said he wanted to know why Chugach and the city had not updated and replicated the 2007 study. Thibert said Chugach had done its own independent analysis through a New York-based economic consulting firm. The nine-page report, dated Jan. 23, describes the terms of the Chugach proposal and asserts it will lead to savings and lower rates over time.